Artists' Refined Linseed Oil is an Oil Painting Medium. 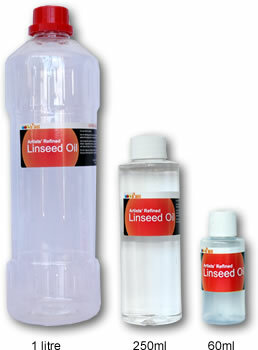 This Linseed Oil is used to reduce and thin the consistency of oil or alkyd paints, increase transparency, the gloss and to slow the drying process. As well as yield a tough, durable paint film. CAUTION: Vapours can be harmful and skin contact should be minimized. Harmful if swallowed. Use with adequate ventilation. ​Do not leave rags or cleaning fabrics “screwed up” (spontaneous combustion may occur). Sold only in New Zealand.